First, I apologize if I have not been around with my comments on your blogs. With the holiday busy-ness and the post-holiday busy-ness, I have been afraid to open my blog reader. I simply cannot catch up at this point and would need a week or two to fully be abreast. Plus, I have been down with a virus the last week. I call it the Nissin virus, because this virus makes one lose one's appetite and just want to eat Nissin instant noodles. I used the olive oil dough from Artisan Bread in Five Minutes a Day. We had some olives in the fridge and I wanted to use them up. I didn't want to put too much olives though, as some of our family members are not keen on olives. I sliced some red onions and sprinkled them on top. The bread baked for about 25 minutes in a preheated 425F oven, until it was crispy. The dough rose nicely and it was very light and puffy. The smell of the olives and red onions was quite intoxicating! Looks like a fabulous bread! Pass the bread this way, please! I just got this book for Christmas - I can't wait to use it. The shipments of our presents is taking waaay too long! Ok, that's it. I Need To Get This Book. Love the combo of onions and olives. Flatbread on the bbq is also really great. This is a Mediterranean feast all by itself... that's one great looking flatbread, guys! The browning looks perfect. Love that book! Wow, I don't even like olives, but I wouldn't be able to pass up a taste of that. I really need to get into that book. Thanks for remind me that I have it. I'm not one for recipe books, but this book is inviting from all the posts I have seen about recipes from the book.The bread looks so delicious! Thanks! We're finally getting there... to "well". Olives will grow on you. Especially here where they're in tiny tiny pieces. They impart a wonderful aroma, at least, even if you're not going to eat them! We'll be looking forward to your creations from it. 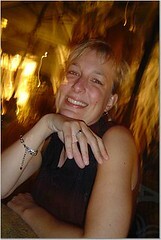 I saw your picture on tastespotting. 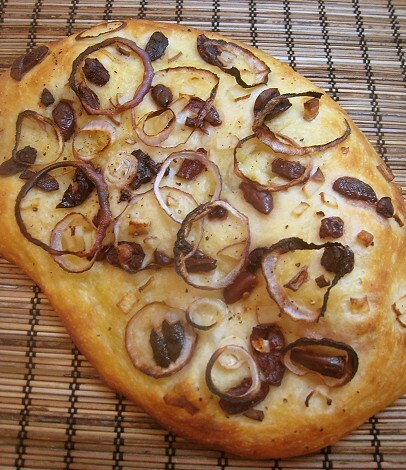 Your olive onion flat bread is fantastic! You got such a beautiful color on the crust! Thanks for sharing, I love seeing pictures of the beautiful creations people make with the dough.